264 x 180 mm. – 143 leaves, 9 large illuminated initials. 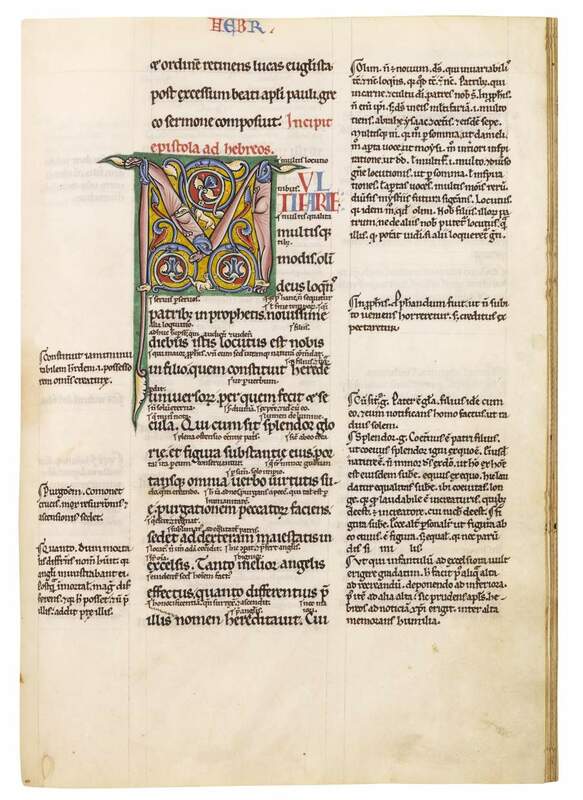 Epistles of St. Paul, glossed, in Latin, third quarter of the 12th century. 264 x 180 mm. – 143 leaves, with 9 large illuminated initials. The fourteen Epistles of St Paul, with the "Glossa ordinaria", in the standard order, the present volume is one of the earliest and most handsome of the luxurious glossed biblical manuscripts. These stylistic characteristics point to the abbey of St. Albans, where Abbot Simon endeavoured to enrich the monastery’s library. Simon, according to the Gesta Abbatum, ‘repaired the scriptorium, at that time almost disused and in poor repair, and introduced into it certain praiseworthy customs’. He was especially keen to acquire copies of glossed books of the Bible, maintained close contacts with the Augustinian house of St Victor in Paris, and is known to have sent scribes there to copy new texts. This manuscript represents one of the most important witnesses of the so-called Channel Style of a group of book illuminators who were active in England and Paris. The main exponent of the ‘Channel Style’ at St. Albans is called ‘the Simon Master’, because of his involvement in Abbot Simon’s books. The Simon Master was also responsible for the decoration of the present manuscript. He was an itinerant craftsman active on both sides of the Channel, and there is still much scholarly discussion as to how he managed to operate in France and England at the same time. However, there is strong evidence that such exchanges took place. These glossed manuscripts of the 1160s are the earliest books with any substantial illumination attributed to Paris, and are probably the first books made in Europe in some kind of professional workshop. The extraordinary quality of book craftsmanship and design in the present manuscript deserves to be emphasized. From the soft, high-quality vellum to the fine script and highly finished illumination, this is a book of extreme elegance and finesse.